We are excited to introduce the NEW Ball Collection Elite Amber Glass Mason Jars. The new wide mouth jars will help protect your preserved food from harmful food-damaging UV rays. Amber glass blocks 99% of UV rays, allowing your preserves to be shelf stable for up to 18 months. The jars can be used for home canning, storage of herbs, spices, coffee or tea, decorations or gifts. 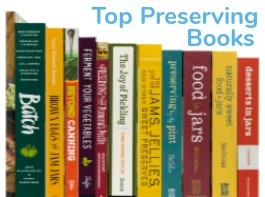 We love the rich amber hue, but mostly we love that the jars offer a unique property to protect our preserves longer. 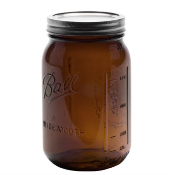 The wide mouth jars are available in 16 oz., 32 oz., and 64 oz. They are sold in cases of 4 with Suretight bands and lids and they are MADE in the USA. Why is Amber Glass Better? 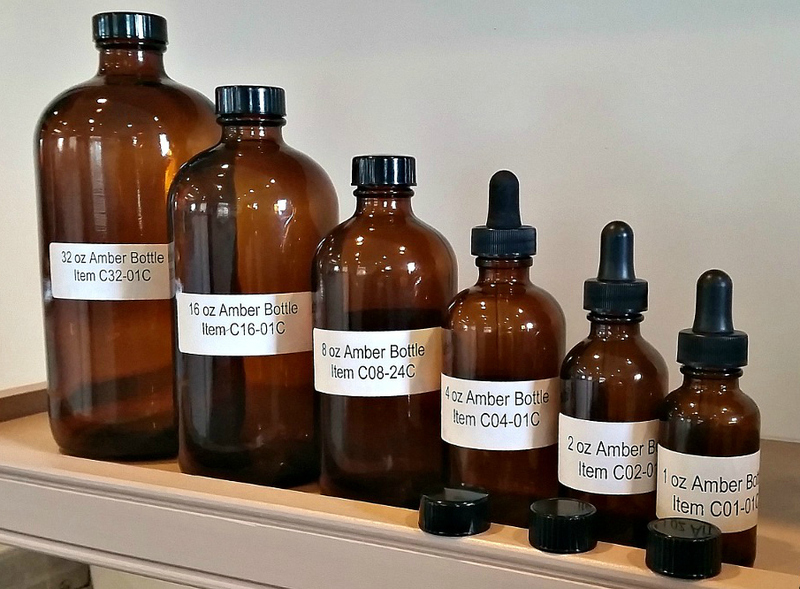 In addition to protecting fruits and vegetables, amber glass is actually the best glass for storing extracts, oils, home brews, bitters, specialty drinks and other liquids. 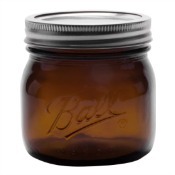 Because of the powerful UV protection, we carry a wide variety of other amber glass jars. 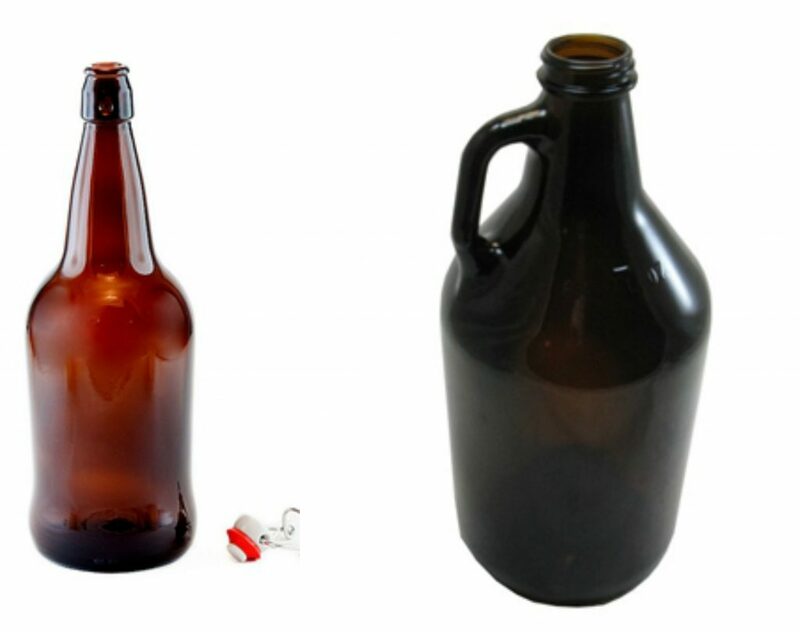 Our Amber Boston Round glass containers are available in 1 oz., 2 oz., 4 oz., 8 oz., 16 oz., and 32 oz. 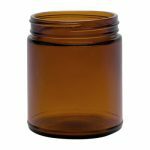 The PolyCone Lined Phenolic Caps used for these jars form an exceptionally tight seal and provide a good chemical barrier too. For those that have precious oils they want to keep protected the 1 oz. and 2 oz are great storage solutions. Our customers who make candles and bath & body products tend to use our 4 oz., and 9 oz. straight-sided jars. They work nicely for light sensitive products. 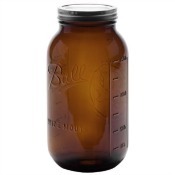 We also carry EZ Cap jars and Loop Jug amber jars which keeps home brews and Kombucha protected longer. You can read more about the benefits of Amber jars here. Three lucky winners will get to pick one case of the new Ball Collection Elite Amber jars. Winners get to pick which jar they prefer. Use the Rafflecopter widget below to enter. Good Luck! Homemade fruit syrups and lemon curd is what I’ll fill those gorgeous amber Ball jars with!!! I’m planning on canning some green beans from my garden..
We drink a lot of coffee so I would fill mine with whole roasted beans. Dried herbs would love a new home too. Thanks for the opportunity. I love the idea of using them for kombucha! I need amber jars for vanilla that I’m planning to make. I will store anything and everything in those jars! I love the colored Mason jars and this amber color is so pretty. I use the jars to store nuts, rice, dried beans. And homemade vanilla extract! Love these new amber jars & would fill them with whatever I canned from my gardens! I would love to use these for vanilla extract! Everything!! will go in my jars! I would my sweet chunk pickles in these. Jams and jellies too. I would use these for homemade vanilla. These are perfect for my herbs! Love these for herbal storage! I would fill these with my infused oils, herbs and dried flowers! These would be great for my canned sauerkraut and apple cider vinegar .. I finally have a big enough garden to be able to do more cannning..Thanks for sharing this giveaway. .
I’m going to use mine to store herbs and tinctures I use for my business and herbalism studies! Amber is the best! Perfect for homemade vanilla extract. Love the jars! Would love to fill them with anything I can! Ah, these are wonderful! As an herbalist, much of my herb storage is done in jars . But the clear jars let in the sun and I’ve considered painting them to mitigate the UV damage. I’m excited that darker glassed jars are available now, as they’ll still fit my lids and accessories. So yes, these would be stuffed with foraged herbs. Tomatoes, Peaches, and Applesauce will be perfect in these beautiful Amber jars! I am also an herbalist and would use the jars for making and storing all the tinctures I make from the plants in my garden. I would use them for jams. Wow I would just stare at it for a while! Vanilla, sauerkraut, pickled onions, oh endless possibilitites! I would use for putting dressings in & putting out on table ! No storing, Showing them off ! I love them ! I think these would look filled with coffee!! And other dry goods on the counter that are more sensitive! I think I might use them for fermenting. Thank you for offering this give away! I am loving these amber jars! I would use them to make up batches of cleaning supplies that use essential oils, can with them, and store dried flowers and leaves in them. Thanks for the chance to win some of them! I’ll use these beautiful amber jars for storing colloidal silver and herbs. And probably a lot of other things, too! I am eager to try the new amber color! Thanks for the chance to win. Want to put some stuff I do not want to spoil. Plus look cool with my other bottles. I loved the different colored jars. I uses several hundred mason jars every year. I would fill the Amber jars with color neutral items like applesauce! I want to use the for my herbal medicines! I’ll use these amber jars to store my dehydrated foods. They store best if they are protected from light. In love with mason jars, I use them for drinking glasses, to storing pens/pencils..to pouring pudding in them. I think I would put cordial in these jars. I would use them for dried herbs and vegetables. I love these jars! Great for storing olive oil! I love the looks of these jars. I do a lot of canning and these would be so wonderful for many of the items I can. I love your products. I would us just love these for my garden vegetables!!!!! Would love these for my dried herbs & veggies. New jars would be a luxury. II’d fill mine with hot pepper jelly. These would fun for fermenting, which I have only recently started. Would help keep the light out, but I wonder if I could see what was happening ok? I just need to be able to add these to my ongoing collection of jars. For some herbs and oils. I am so excited about these. Fruit juice from garden and homemade zkombucha. Would love to can red beets in these jars! Wow, it’s about time they came out with these. So many things need to stay out of direct light. These will be very useful. I use mason jars for everything!! The amber is a bonus! Leftovers, broth, applesauce, snacks, lunches, everything! Very excited! 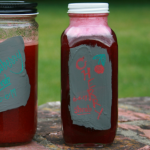 Homemade remedies and freeze dried fruits and veggies! Homegrown Honey from Local Bees! Those little pints are beautiful. I think the apricots escaped the frost this year so it may be time for another batch of jam. I am not sure yet what I would fill the beautiful amber jars with. I am a jar lover and would find something to do with them. This is a great product and will go down over the future generations having a positive impact on the canning world. I would fill my amber Ball jars with herbs that are sensitive to light. Homemade vanilla, flavored vinegars and jams/jellies to start. I would fill them with homemade fig jam from our trees and give as gifts. Tinctures, Infused oils, herbs and spices and more I am sure! I am so excited about these jars! Great for any canned goods or the smaller jars would be great for essential oil infused products! What to fill these with?!? The possibilities are endless ! These are the best looking jars so far. Plan on making vanilla and these are perfect. I’d use the jars for fruit syrups and pickled carrots! All types of canning and crafts. We grow many apples and make our own cider. Homemade apple butter made with our own fresh apples and fresh apple cider, amber colored as well, would be eye appealing and scrumptiously delicious in these beautiful amber jars.Would make a lovely addition to anyone’s table. I love the new amber jars! I keep dried herbs and my ground coffees and teas in them. They are not only awesome but beautiful! Thank you. I’ll let my daughter decide what to put in them — she has the fruit trees! I would use them to store any of my normal canning stuff or maybe fermenting. I’m so excited for these. I keep a lot of jars of dried foods on a shelf in the kitchen, where they’re exposed to indirect (and in a few cases direct, but only for a short while) sunlight. I usually keep them in the purple Ball jars, but amber will be so much better. these jars look amazing! I can think of hundreds of uses for them! We LOVE the amber colored glass!!!! AND so does our customers. 🙂 Great for candles as the UV protection protects our soy wax candles. Have a great day! I can think of so many things to use these for. They are just beautiful! I love the amber color! I love the color, so many options to fill them with, maple syrup would be one. Oh, how I love all the canning jars! And now amber, swoon! Would love to try these jars. Love that we have the option of amber now! I can sure see how the amber color would be beneficial for making herbal tinctures and vinegars. Great idea! I would put peaches and tomatoes in there – also green tomato sauce to keep the color bright! Thanks for the giveaway. I’d use the jars to make a great corn mango salsa. The color would help to preserve the color of the mangos! These jars are just beautiful. I would use these for everything I can in addition to storing all my herbs and herbal tea mixtures. I would LOVE to fill mine with dried herbs from the garden! I love the color of these jars. I’d like to make candles out of the 16 oz jars. It goes nice with the natural color of soy wax . These are very pretty. I would make sauerkraut in them. I would love to put my dried herbs in the new amber jars, so they would retain their dark green colors. I’ll use these for apple pie filling or spiced apples . I’d use mine for my homemade bbq sauces I make and for my special seasonings I use. This is awesome! Will definitely be ordering. Perfect for tincture making and storage. Beautiful to store foods on open shelving for all to admire. Why did it take so long to think of this protective color? Homemade sauces and canned produce is what I’d fill these beautiful jars with! These are great! I’m trying to learn about natural herbs and remedies, and all the books and websites always show this lovely amber glass when they show their pantry. I would like to win these, and preserve the items I can dehydrate from my garden in them!! Homemade BBQ sauce! 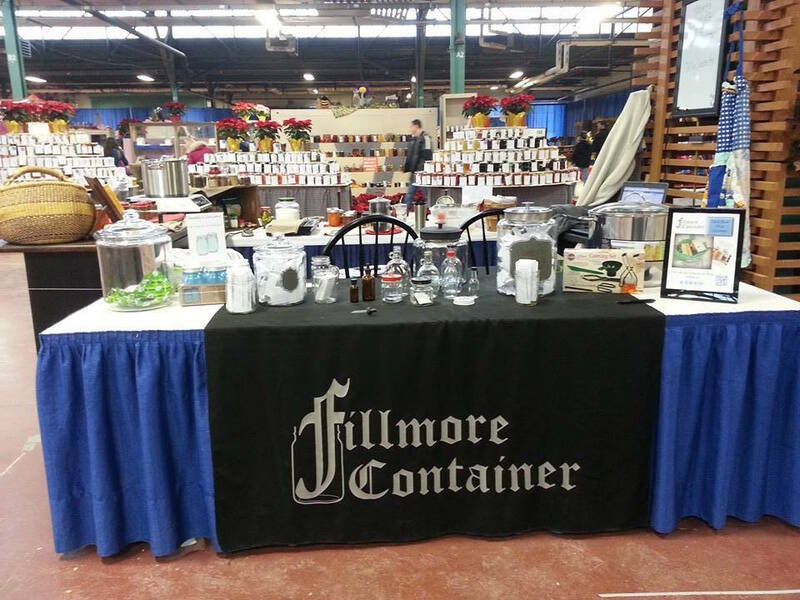 Fillmore is such a great company, been a customer for years! We will fill these jars with delicious vegetables grown in our victory garden !!! Either Tomatoes or Venison. I can everything. I want to try making my own Rock and Rye and these jars would keep it fresher longer. So many ideas….I need to get those oils out of their improper colored bottles…. my apricot jam would be fabulous in amber….my different flavor collections of loose teas….. If I don’t win a case, I will definitely buy some of the amber mason jars. The jars are right up my alley, I’m a jar addict. I look at them and see a beautiful piece of art. Would love to win a case of amber jars. Mason jars are my favorite. Everything! Canning veggies, syrups, herbs etc. Thank you for the chance to win! homemade vanilla and other goodies! i can hot peppers ,jars will work perfect. My honey will look beautiful in these jars. They remind me of vintage collectable jars, and my customers are going to live them. So many uses and colors! I love all Mason Jars.. this would be a great addition! Love the antique look and crazy about the food protection aspect . Can’t wait to use! Liquid Apple Pie will never look so good! I like these new amber jars can’t wait to get some . I’ll put my raw sunflower seeds and nuts in them. These will be great for herbal remedies! I love the recipes and tips! Thank you! Our students have used your jars in the past for candy on Prom Night! Fabulous keepsake! Thanks, Cindy. We’d love to see a picture of the candy filled jars from your students! I do a lot of canning. I would probably fill the jars with meat. Hoping to be a winner of a set of the new jars. Homemade body butter, homemade face moisturizer, homemade deodorant & homemade makeup remover. These will be perfect for storing my loose leaf teas and herbs! I’m also working my way up to making some homemade bitters, which that small guy will be great for! I love that they keep UV rays out, I’m not up to date on what should be kept out of the light, but it has to be useful! Oh my, I Love these. I would put anything and everything in them. Thanks for the chance to win! OMG! These are gorgeous and I cannot wait to fill them with my wares. Love it! I am so excited to get some of these. I like the look of the new amber jars. I’ll store all the things in those pretty jars! I am a soy candlemaker and my entire line is in the amber straight sided jars and these would be a lovely addition for some new fragrances!!!! I always can tomatoes and dilly beans! These jars would make a great gift jar of my home canned produce!! Really a great addition. Anything for longer shelf life and they are beautiful. I have a family wedding in October so I will can their favorites as a wedding gift. Loose tea leaves, nuts, herbs and oils for starters. I would use the for canned fruits, vanilla, jams, and jellies. I would love to have these jars to not only have storage for coffee and tea but they would make great holders for gifts to my children filled with one of my special recipes for healthy eating! I do a lot of dehydrating and these would be perfect to block light from the dehydrated foods. Everything and anything. Love, love, love Ball jars. Great for the business and home use. I would pour my 100% soy wax candles in them! I will fill my new amber ball jars with my own dried herbs and homemade elderberry syrup. These will be perfect for my dehydrated strawberries! I make homemade liquors and dark glass is preferable when steeping the botanicals. These jars are perfect. These are a must for all my dried herbs!! Beautiful color! I can imagine them on my shelf with all my dried fruits in them! This is FANTASTIC !! Thank you so much, what a great idea! I can with a 89 year old master canner and she will love these ! I’ll probably use them just like I would standard canning jars. I just love having different colored jars. These jars are Amazing ! I will use them for candles ,pickles,coffee,tea,candy,jelly,peppers,sauces,tomatoes and so much more .Just love the protective color ,so excited to try these . I would love to fill the new amber mason jars with my canning! I’d fill them with pickles. Homemade coffee liqueur. These jars would be gorgeous for that! Looks nice don’t know how pickles would look in them though. I dehydrate a lot of foods. These jars will be perfect! I’ll use mine for picnic lunch containers and canning summer harvest from the garden. Oh…I would LOVE these for my canning this year ! Need to can some garden stuff in these pretty jars. I would store Apple butter in these!! I would use the jars for my homemade maple vinegar, vanilla, and home grown veggies. Hopefully some fruits and veggies from this summers harvest! I would fill them with coffee beans and/or rhubarb butter. They are just beautiful! I was just looking for a good way to store my coffee beans – these will work perfectly! Really need this addition to my kitchen. Especially for my homemade vanilla. Love that the 16oz are wide mouth jars. I would love to try these amber jars!! i would can whatever make it in the garden this year! I use only ball jars and love all the colors! Amber jars are great for Essential oils and Fragrance oils that would normally eat through most plastics. Love all my Ball products! I’ve been canning my own sweet pickles for years and my next venture into canning will be tomatoes, tomato sauce, spaghetti sauce as well as any other interesting, healthy item I come across. These will be perfect for so many things I make and do here on my homestead! Very excited to have shared and look forward to seeing them on my selves!! New jars for more jam. Love them! I’m a budding herbalist. I love the efficiency and reliability of Ball jars. These gorgeous amber jars would be such a welcome addition to my herbal cabinet! I love the look of these. I can a lot. Love your one piece jar lids also. I purchased them for our apple butter we made for the church. Big hit. Thanks for everything. Delivery was excellent. I use those pretty Ball jars for herbal tea. Lovely! I would fill my amber jars with tomato sauce, salsa, chicken soup or whatever finds its way into my canner! 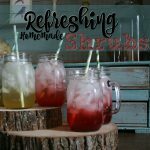 Would definitely use the Amber jars for kombucha! What to fill the jars with? Probably dry pantry storage. Those new jars look wonderful! I can homegrown fruits & veggies all summer long. I also can broths and meats in the fall. I’m crossing my fingers that I’ll be a winner! Thanks for the chance to win a case! Love these!! Perfect for my Strawberry Fig Preserves. I just saw these yesterday and thought how great they would be for storing my herbal medicine! I live in Florida and don’t have a basement to keep my jars in a totally dark area. There is daylight peeking into every room, even the pantry. This will help so much. Thank you! I recently learned how to make homemade sauerkraut. I’m going to use it for fermenting veggies. These would be wonderful for syrups and juices! A must have, for my herbs! The ideas are limitless! I would store my dry goods on my new open kitchen shelves, and ferment in them. These look great foe storing herbs and infussions. I am really impressed with the new amber color. And that it will give more time than the clear. I do so much canning each year and always use your your jars. I really enjoys using the 16 oz, for Pica De Gallo. I will store dried herbs and smoothie powders! These look perfect for making cold brew iced coffee or sweet tea. Thanks for the giveaway! I love the amber color so I think I would use them for storing grains and dried fruit in the pantry. These amber jars are pretty enough that I’d want to use them for things I handle often, rather than putting up jams, because I’d never get to see them. I’m thinking they’d be great for things like iced tea, or sweetener for my tea, or flour to shake out onto my work surfaces when I’m baking, or things like that. I just entered the contest. Probably too late. Haha. Oops! I was supposed to say what I would can in the amber jars…. Um, probably apple butter. It’s usually in dark jars at the grocery so that makes sense to me. I will give these to my oldest daughter so she can fill them with her favorites! Can’t wait to see these! Putting while coffee beans in them would be great, especially with the new coffee lids! Where the purple and green jars are pretty, these jars are more practical. I would can fig preserves or pear preserves in these beautiful jars! Just in time for my green beans! These would be awesome for homemade vanilla extract! don’t know about the amber color but would love to try them. Spices, and pantry staples. My canned tomatoes, too. Depending on what size I choose, I may use for dry good storage, canning produce from my summer garden, or using them for my essential oil product blends. These look great! I would fill them with fig preserves! These amber jars would be nice filled with an apple chutney. We put everything in them! I love to make jams and I’d like to start canning fruit. Homemade extracts: vanilla, lemon, mint…. These would be perfect to store flavored sugar mixes I make for cotton candy. thanks for the education about amber glass….i didnt realize it blocked uv rays! Fruits mostly so they don’t discolor so easily! Will can some food for long term survival/storage! Beautiful new color! I would definitely add this to my list of craft ideas on my Etsy sight. Salsa, as soon as the tomatoes and peppers come in. These would be great for my dried herbs and homemade vanilla. Love all your jars! Great for holiday gift giving. Hope you continue to offer new colors. I use the blue and green for storage of all my dry goods in my cabinets. Thank you. These would be awesome for all the stuff I dehydrate! Greens, mushrooms, tomatoes, etc. I love the new Amber jars! Assorted teas and spices will do great in these jars I am thinking. I like the Idea of the amber jars to help preserve the color of my picked Green beans! The 64 oz jars are perfect for making curtido (Salvadoran fermented cabbage) and storage of flours and dried beans. We’ll likely put our colloidal silver in these jars. Love the jars, can’t wait to start canning.. I will use the jars for kombucha, cold brew coffee and canning applesauce. I would put my mustard pickles in these jars. I can our fruits and vegetables every year. I also know the value and protection amber glass provides the contents. I am so glad to see that finally Ball has too. Great looking jars! Would love to fill with homemade goodies!! I believe I will fill up some amber container with zucchini relish and hot peppers. The options are really limitless! leftovers, overnight oats or chia pudding, salads, smoothies, maybe even candles and oil infusions! They are perfect for wild crafted herbs! I think it will be dill pickles! I store a lot of things in mine now. I love putting the grains I get from the bulk in my jars to store. I would most likely store my grains in them. I will fill these new Amber Mason Jars with my special peach jam, they will be lovely gifts! They are so pretty , I probally use the smaller ones for homemade body scrubs and body butters! There is a lot of canning I want to do who knows, Love these! I always use Ball jars for my canning. I also paint them up pretty to keep my homegrown spices and herbs (once dried) from losing their potency over the long winter. Love these. Especially the 64 oz. ones. Pie filling and maybe some homemade wine! I can a lot of pickles and okra every year, this year will be no different. Just thought the Amber Jars would look cool. Infused oils was my first thought!! Yet almonds and other nuts were my second thought. Love the colored jars – perfect for dried beans, wheatberries, gorp, kasha, and homemade sauerkraut! Homemade maple syrup, salsa, soup, preserves, pepper jelly, jalapeno peppers, and pickles!! These would make pretty flower vases! I have a wonderful sweet pepper recipe. Can’t eat a hot dog or hamburger Without It. I have been making this For About 40 years, These Jars Would Be Perfect And the ONly Improvement Needed! I would like to fill them with apple butter or apple pie filling, Just seems like a fall thing to do! I am so excited! I didn’t know anyone made these and I would love these for storing our spices. I would love to can anything from my garden in these pretty jars. I bet peaches would look lovely! I think it would be great to fill with coffee. Winning would be a great bonus since I’ve been off work for four months without pay!! I am not sure what I will put in one. I really do like the looks of them. I love these jars! Great for dry herb storage! These amber jars are just beautiful! Can’t wait to use them. 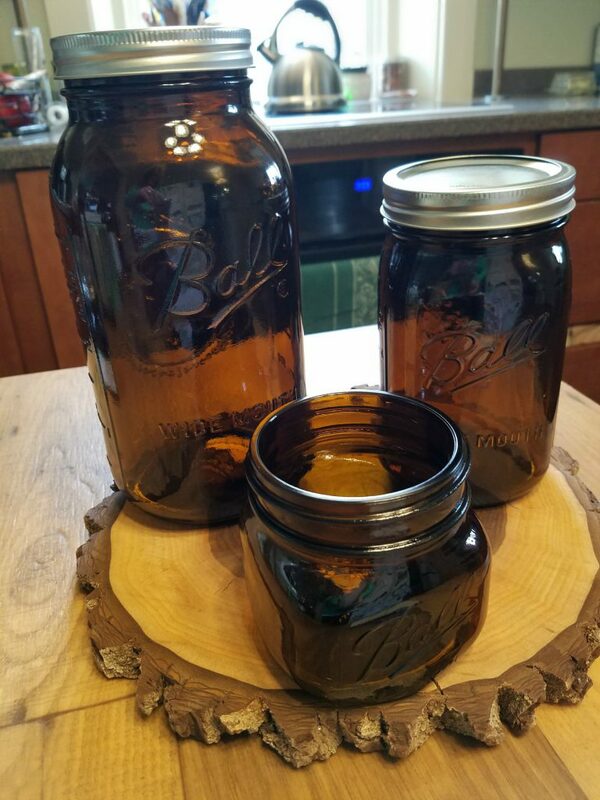 I just love the new Ball Collection Elite Amber Glass Mason Jars. My 98 year old Mother just moved in with me and I promised her we would be doing some canning this year. What fun it would be to use these! Not sure what I’d put in them. They look so pretty as they are. I might use them for fresh flowers or lemonade. Used them for so many things. Not sure yet….the possibilities are limitless. Have to get some to try them out and theywill go beautifully with my kitchen. Oh WOW! 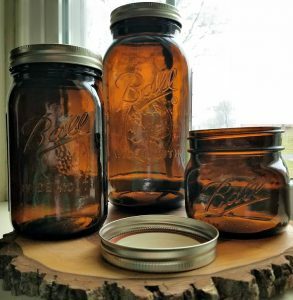 I’d love to add these Amber Ball Jars, to my canning supplies! I LOVE this amber color. I can’t think of WHAT I will put in it since I love seeing my preserved food but…maybe albacore since it’s never actually as PRETTY as it tastes. I love to make my own sauces with tomatoes – pizza, spaghetti, chili, sauce, salsa. I also enjoy canning apple pie filling. That is what I would use them for. Thanks. I have been using BALL jars for 65 + years…I have a 100 year old collection, plus 100’s that I can in. Wow! We’d love to see a picture of your collection! My favorite thing to can. peaches. Love to add my candles to this jar.. Beautiful color. I would use them for gifting: gifts from the kitchen! I will fill them with everything (craft items, food etc). I love the Amber! I use ball jars for everything! They would make an interesting addition to my jar collection. I like the quarts. I would love to make candles in these jars. The light through the jar would be beautiful. I love Ball jars. I have some that belonged to my Grandma. I would use these jars for storage of spices and other dry goods. You can use these jars for so many things but I would use them for hydroponic growing some lettuce and herbs. I only can find the clear mason jars and I have to either paint them or cover them to keep the light out but with these jars I wouldn’t have to do that. I will fill these jars with an assortment of fruit and vegetables including corn,green beans,beets,peaches,pears,applesauce,this list goes on but I will be staring with stewed tomatoes! I can think of so many things to use the jars for. Canning jams, pickles, applesauce, and putting away dry goods as well. I use them to store dried fruits and other snacks. I want to use these for everyday staples and use on my counters and shelves like canisters. They are gorgeous! There will be a lot of canning to be done around here. I also do candles in Ball and Mason jars. I would like to try these jars. I can all summer and fall . I hope I can win . thank you. I’ve been looking for new jars for my dried herbs, these would be perfect! I will fill the jars with homemade jams and preserves. I love the new amber mason jars. Perfect for wild plum jelly! We not only can but we also put all dry goods in jars. i like to preserve and capture my garden in the jars for the winter months. jams, jellies, relishes, vegetables and the like. Cowgirl Spice loves fun jars for our products!! The 16 oz would be perfect for my jams and jellies! I would put my dried herbs in these be a jars. I also can and would use them for canning my potatoes. I’d love to win a case of these beautiful amber colored jars to put my honey in to sell. These are a gorgeous new collection! I would fill them with hot peppers in tomato sauce. Yum. I also think they would make a unique jar for my candle shop as well! Thank you. I make and sell herbal seasonings, oils and vinegars. These new amber jars are perfect for storing fresh dried herbs, steeping oils and vinegars, and gifts. These will be on my next order. Thank you. I’m going to fill mine with Herbs and Fermented goods. I put up many pints of apple butter each fall, for our own use and to use as gifts. I think the 16 oz. jars in the amber color would be the perfect compliment to the apple butter! I love these amber jars! Peach preserves always taste good but, they could look better if the light didn’t get to them. Love the color. Will find lots of uses for them. These will be my wishing jars! I whisper my wishes into them at night and tuck them under my pillows while i sleep! I would fill the jars with my herbs and spices. Use them in my home apothecary. I’m planning on canning veggies from my garden this year. I’d love to use these jars! Thank you for the chance! I make a peach dressing/dipping sauce that would love to be inside these jars. I would use these new jars to hold grain for daily use. I’d use either the 32 oz or 64 oz. I would surely fill up these amber jars with homemade peach jam!!! I can’t wait for fruit season! Thanks for the chance to win! This year I’m planting 5 different sauce tomatoes for pizza sauce , taco sauce, salsa, sphaghetti sauce, Marinara sauce and plain sauce. It’ll be the first year our apple and peach trees produce and my kiwiberry vines should too! I can’t wait!! a memory my grown children often speak of. Basically, that they remember picking and snipping beans. That was most of my summer. In the fall I went back to my other job- teaching kindergartners come September. I was and still am proud that we did this as a family. I’d love to make a bunch of salves and lotions in the amber jars! I love these jars. I’ve been switching out all of my plastic pantry storage with glass. These would look great on the shelf. Anything I put in it would look great. Cause they look awesome. Love these!!! Would be great to add to my canning jar collection!!! What beautiful jars. I cant wait to win some and start canning my jams and jellies! These are amazing, the possibilities are endless. I use Fillmore for all my jar & container needs. These are amazing, the possibilities are endless. I use Fillmore for all my jar & container needs. I’m thinking homemade pickles in the summer of 2019!!! 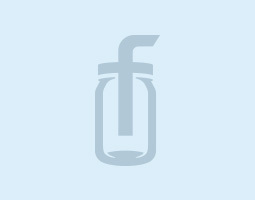 These look great…….fruit will be wonderful in these jars. I would use them for canning jams and jellies and our fresh veggies out of the garden this summer! I think they would also work great to store beans in!! I would use them for pasta because I read somewhere it should not be exposed to light. I love Mason jars but these could also.be used in some beautiful fall decor. These would be perfect for dehydrated produce! Homemade shaving creams, scrubs, body lotions. I collect bottles and this will be a great addition. Most of mine are older , purchased and dug up but they won’t mind a new cousin. I’ll be looking for them in the stores if I don’t win. I use the clear ones for lots of things. I’m a country girl. I would love these for my jellies and jams and everything else! Very nice, would love to add to my ball collection. I’d love these to store dehydrated veggies in.. Thank you for the opportunity to win some. I will use these beautiful jars for storage and crafting. Who knows, I may even start canning again! I will use the smaller jars for homemade creams and salves! Ball jars are perfect for candles. Looking forward to trying the Amber Ball Jars. I would put dried beans, peas, etc. in the jars. Love the amber glass! I love the new color. I want to use them for my tea and spices. WOW! I would love some of these amber jars. Thanks for entering my name. I live my jars from Fillmore Container! Takes my products from homemade to store ready! Great color! Have used amber jars for various products for years! Glad to know they are available in all size jars and bottles from your company. I love making bath and body products that I can be sure of their quality because of the amber glass. This is a fantastic product that is going to take homemade goods to a higher level! Yes, these are great for bath & body products. Have you seen our other Amber jars? Many of our bath & body customers really like these straight-sided amber jars. Will you be offering any 8 oz. amber wide mouth jars in the future? I make handmade natural products ad trying to get some consistency in my packaging. We carry a 9 oz. amber jar, but it is not a wide mouth closure. Here’s the link to that jar. We do carry a 16oz. wide mouth in Amber. You can find that jar here. Or shop the entire Amber collection here. Can I re-use my Baby Food Jars?